Independence Day celebrates American community and unity. 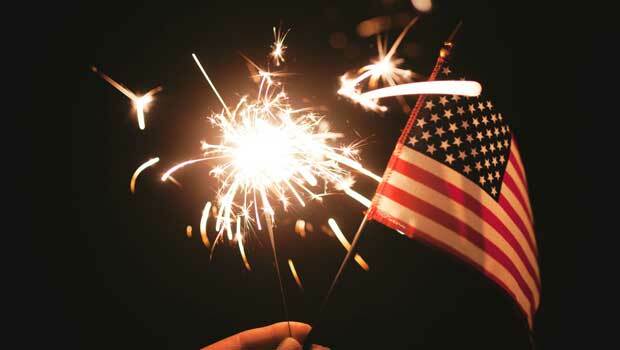 Independence Day is often considered the most “American” of American holidays. Most celebrations are officially kicked off with a parade honoring the history of the country and those who fought for its freedom. Veterans, volunteers, marching bands, and children with flags parade down main streets as brass and percussion instruments play historical and patriotic folk songs. During and after the parade, people eat a variety of classic American treats: popcorn, fried dough with powdered sugar, barbecue burgers and more are sold at stands, or barbecued in the yard. As night falls, anticipation grows for the main event – the fireworks! Friends and families across the country gather with blankets and chairs to open parks and fields, or make their way towards the water to watch the sparkling display, depending on where they are. At a glance, it is a day to celebrate the local communities we are all a part of that make the United States united. However many of the events, like reenactments and parades, do incorporate the history as well. The Fourth of July celebrates the official signing of the Declaration of Independence from Great Britain in 1776. Here are some examples of spectacular annual festivities to kick off the official “birthday” of the USA! Since 1976, Macy’s department store has sponsored the Fourth of July fireworks. In true American tradition, Macy’s also sponsors the Thanksgiving Day Parade. For Independence Day each year, an iconic display of fireworks takes place over the East River starting at 9 p.m. For the best spots, head over to Brooklyn Bridge Park, the Brooklyn Heights Promenade, or the east side of Lower Manhattan. The show is a spectacular firework display and certainly worth the crowds if you go. However if you cannot make it, the fireworks are also broadcast live on NBC in an hour-long special with musical performances. The perks of the NBC broadcast? You can enjoy the show in the comfort of air conditioning! A longtime Coney Island tradition, Nathan’s went from a tiny Brooklyn hot dog stand in 1916, to the “Famous Nathan’s Hot Dogs” that New Yorkers know and love. In the early 1970’s, Nathan’s began an annual Hot Dog Eating Contest every year on Independence Day. The event has garnered so much attention, it is actually broadcast on ESPN, the professional sports network! So even if you can’t eat 70 hot dogs in 10 minutes or less, you can cheer along the competitors and eat a Nathan’s Famous hot dog in solidarity. This event is held annually in the main plaza of City Hall at 9 a.m. for those of you who want a taste of American history. Afterwards, there is a parade that walks to the Granary Burial Ground, where wreaths are laid on graves of fallen patriots. The parade then continues to the Old State House, where the Declaration of Independence is read from the front balcony, where it was first read to Boston citizens of the Revolutionary era on July 18, 1776. The Boston Pops Fireworks Spectacular is one of Boston’s most popular events. A traditional fighter jet military flyover is coordinated with a performance of the national anthem, The Star-Spangled Banner, and each year different popular musicians perform. Traditionally, a navy ship called the USS John F. Kennedy sails into harbor while the orchestra plays on the banks of the Charles River, featuring American music and ending with 1812 Overture. Following the performance is a grand fireworks display at 10:30 p.m. You can catch the Boston Pops event through a free live webstream. The Freedom Trail is another way to delve into the history of the United States. The 2.5-mile, red brick-lined route leads you to 16 historically significant sites — each one an authentic historical treasure. You can explore museums, meetinghouses, churches, and burying grounds. Tour guides bring the history to life through stories about the revolution and the rich history Boston holds. It’s a great daytime activity, especially if you plan to see the fireworks later that evening. Watch the Fourth of July parade during the day, then head to Geneva in the evening to enjoy the Annual Carnival with food, games, and rides. Conesus and Honeoye Lakes also host a special Independence Day tradition and bring the festivities to light – literally – when they illuminate the night with a Spectacular Ring of Fire. Residents along the lakes ignite fires and flares that make it look like the lake shores are on fire. This tradition started with Labor Day weekend, but now is often enjoyed in July as well! The nation’s capital is home to some of the most elaborate Independence Day celebrations in the country. Each year, marching bands from across the United States, military and special unit officers, and floats decked out in America's red, white, and blue parade down main streets in celebration. The parade kicks off at noon on Constitution Avenue and NW 7th Street. On the U.S. Capitol's West Lawn, the celebration continues with a 90-minute concert (open to the public free of charge) where the National Symphony Orchestra plays 1812 Overture, finishing with live cannon fire provided by the U.S. Army Presidential Salute Battery. Home to the flag that inspired Francis Scott Key to write the United States' national anthem, The Star-Spangled Banner, this museum is a must see. If you need a break and want a sweet treat, this is the perfect opportunity. Tudor Place is the historic estate built by President George Washington's granddaughter and her husband that still hosts Independence Day events. Tour the beautiful lawn and garden, make-you-own-sundae at an ice cream bar in the front yard, and stop by booths with games and craft-making. Considered the birthplace of America during the Revolutionary War, Philly kicks off the national holiday with their Annual Independence Day Parade, complete with over 50 floats, marching bands, antique cars, and nearly 5,000 marching participants. The parade begins at 10 a.m. at the corner of 5th Street and Chestnut, traveling east towards Front Street for nearly four hours. Party on the Parkway is a great alternative for those of you who would rather mosey from food stand to food stand instead of a parade. This day-long celebration hosts entire city blocks of delicious food trucks from local vendors, interactive gaming booths, and more on Benjamin Franklin Parkway from 20th Street to Eakins Oval. Because of its location on the coast, Seattle hosts its largest event on the water. The fair goes all day, with live music in Gas Works park all afternoon until the fireworks display over the Lake Union in the evening. Each year, L.A. holds its annual Fourth of July AmericaFest at the Rose Bowl to celebrate. AmericaFest is one of the largest fireworks displays in Southern California, with musical performances and food vendors from every corner of the city. The parking lot opens at 10 a.m., where hundreds of Americans usually gather to set up grills and coolers to tailgate. Tailgating is a social tradition that often accompanies football games, held on and around the open trunk or tailgate of a parked vehicle. By 2 p.m., the food court opens, giving you additional access to some of LA's best local cuisines. Opening ceremonies begin at 7 p.m., ending with the fireworks display at nightfall. Even if you don’t get a chance to see fireworks in a big city, most towns host their own local displays. No matter where you are, you can enjoy celebrating community, history, and family!